MSL Air and Ground Temperatures plus Probable Failure of the Temperature Sensor: Hardware or Personnel Issues? Updated on 9/20/2018. 15.4 MSL Air and Ground Temperature Differences. The REMS Team states that Mars undergoes very extreme gradients between the ground and the atmosphere at 1.5 m above the surface, with differences of ±40K.116 However, inconsistent differences in air and ground temperature taken 1.5 meters apart suggest that ground temperatures from MSL are worthless. The ground temperature sensor likely broke on landing. As was shown in Figure 67, the air and ground temperature sensors on MSL are deeply flawed because of their crude accuracies. For the air temperature sensor the accuracy is to 5° C (9° F) while in the ground temperature sensor its accuracy is just 10° C (18° F). The air temperature sensor has a resolution of 0.1 ° C, but for the ground sensor it’s a full 2° C.
On Figure 75 we see enormous variation in the high temperature differences recorded from Booms 1 and 2 (see Figure 76) vs. the ground temperatures for 1.5 meters below the booms. If NASA is correct then the average pressure on Mars at areoid is about 6.1 mbar with pressures at MSL (about 4.4 km below areoid) ranging between about 7.3 mbar and 9.25 mbar (compared to a 1,013.25 mbar average pressure on Earth at sea level). With such low, near-vacuum pressures, we should expect temperature differences between 1.5 meters and the ground to be fairly consistent from day to day, but that's not at all what the data shows. Before apparent ground temperature failures or REMS Team rebellion around March 20 2017, in the summer the difference in temperature between the two elevations was as little as 2° C and as much as 26° C. In the winter it was as little as 1° C and as much as 30° C.
JPL notes that in its graph of plots with daily minimum and maximum of ground temperature measured by REMS, a change in the pattern just after Sol 120 corresponds to Curiosity driving onto a type of ground with higher thermal inertia -- thus cooling off more slowly in the evening and warming up more slowly in the morning. They write that, the higher thermal inertia of this area was predicted from orbital infrared measurements and is likely due to greater abundance of exposed bedrock relative to soil or sand." That's fine, but we would still not expect such radical variation in differences of air and ground temperatures to occur as often as they are shown on Figure 75A. While there are air temperature sensors on Booms 1 and 2 of MSL, a ground temperature sensor is only found on Boom 1 (see Figure 75B) which was damaged on landing. No ground temperatures were published by the REMS Team or JPL until about 9 months after landing. When they suddenly appeared I asked JPL public affairs man Guy Webster about where they suddenly came from, He asserted that “Damage on landing did not include the infrared sensor that provides ground temp information. Ground temps through about Sol 200 were charted in April on the bottom half of http://photojournal.jpl.nasa.gov/catalog/PIA16913.” Given that we had already successfully prevailed upon him and JPL to alter all (never-changing) wind data for MSL from 7.2 km/hour from the east to Not Available, and we had likewise succeeded in having him alter all never-changing sunrise/sunset times to line up with calculations that my son (David) and I had done, it was and remains our belief that JPL should likewise dump its ground temperature readings and replace them too with N/A. If they were more reliable we could likely use the differences between air and ground to help calculate air density (and pressure). But the simple fact appears to be that the data is not reliable. MSL has given us fantastic pictures of Mars, great geological data and new understanding about water just under the surface in many places (as with a frozen fresh-water sea at Utopia Planitia that has an area of the State of New Mexico). In some cases the proximity of liquid water to the surface likely affects ground temperature, but the ground temperature sensor is not sufficient to establish it. The most important data about Mars remains obscure - weather data. We have no reliable surface wind data after the Viking 1 and 2 landers of the late 1970's. We have no reliable ground temperature data, no reliable pressure data, and no reliable relative humidity data. We had 36 years of wrong sky color that was ordered by former NASA Director James Fletcher, from 1976 until 2012 that was ordered. Further, no lander after Vikings 1 and 2 has included a life-detection experiment, although those two landers (4,000 miles apart) apparently did detect life. The clearest thing detected about Mars so far seems to be the stonewalling that has gone on for four decades with respect to giving us accurate weather data and a commitment to send people there. Hopefully either Elon Musk of SpaceX or President Trump will alter the status quo. 15.4.1 Oxygen Solubility in near-surface Martian environments and aerobic life. Due to the scarcity of O2 in the modern Martian atmosphere, Mars has been assumed to be incapable of producing environments with sufficiently large concentrations of O2 to support aerobic respiration. Here, we present a thermodynamic framework for the solubility of O2 in brines under Martian near-surface conditions. We find that modern Mars can support liquid environments with dissolved O2 values ranging from ~2.5 × 10−6 mol m−3 to 2 mol m−3 across the planet, with particularly high concentrations in polar regions because of lower temperatures at higher latitudes promoting O2 entry into brines. General circulation model simulations show that O2 concentrations in near-surface environments vary both spatially and with time—the latter associated with secular changes in obliquity, or axial tilt. Even at the limits of the uncertainties, our findings suggest that there can be near-surface environments on Mars with sufficient O2 available for aerobic microbes to breathe. Our findings may help to explain the formation of highly oxidized phases in Martian rocks observed with Mars rovers, and imply that opportunities for aerobic life may exist on modern Mars and on other planetary bodies with sources of O2 independent of photosynthesis. The Stamenkovi et el. Study is based on 6.1 mbar at areoid. However we are right and pressure there is really two orders of magnitude higher, there would be even more oxygen dissolved. Figure 75A below: According to MSL, daily high temperatures are higher on the ground than they are in the air. Here we look at how much higher. It's an average of 11.39 degrees Celsius in summer and 15.43 degrees in the winter. But, again, the ground temperature sensor is only accurate to 10 degrees Celsius. Figure 75B shows a graph of air diurnal temperature drops in degrees Celsius for MSL Year 2 summer (orange) and MSL Year 2 to 3 winter (blue). It can be seen that although there are exceptions to the rule, in general temperature drops were greater from day to night in the summer (with an average drop of 68.034° C) than in the winter (when the average drop was 62.1073° C). The most important data about Mars remains obscure - weather data. We have no reliable surface wind data after the Viking 1 and 2 landers of the late 1970's. We have no reliable ground temperature data, no reliable pressure data, and no reliable relative humidity data. We had 36 years of wrong sky color, from 1976 until 2012 that was ordered by former NASA Director James Fletcher. Further, no lander after Vikings 1 and 2 has included a life-detection experiment, although those two landers (4,000 miles apart) apparently did detect life. The clearest thing detected about Mars so far seems to be the stonewalling that has gone on for four decades with respect to giving us accurate weather data and a commitment to send people there. Hopefully either Elon Musk of SpaceX or President Trump will alter the status quo. Figure 76 shows the temperature data released by NASA for the summer of MSL Year 2 and the winter of MSL Years 2 to 3. Summer in the southern hemisphere occurs in months 10, 11 and 12. There are 154 days in MSL's summer and 179 sols in MSL's winter. Winter in the southern hemisphere occurs in months 4, 5, and 6. Before analyzing the data it must again be noted that the ground temperature sensor at MSL is only accurate to 10K/10°C/18°F. See Figure 67. On Figure 76 we see that air temperatures drop more degrees at night (68.034°C) in summer than in winter (62.1073 °C) although lows are colder in the winter than in the summer. Our record for MSL Year 2 Summer are maintained at our MarsCorrect.com site at http://marscorrect.com/photo4_11.html. There is a PDF version available as Annex O to this Report at http://marscorrect.com/ANNEX%20O.pdf. The record for MSL Year 2 to 3 Winter is maintained at our MarsCorrect.com site at http://marscorrect.com/photo2_29.html. A PDF version is available as Annex Q to this Report at http://marscorrect.com/ANNEX%20Q.pdf. We wanted to get an idea of how cold it would get in the dark so we could compare it with darkness on the Earth’s moon. Daytime on one side of the moon lasts about 13 and a half days, followed by 13 and a half nights of darkness. The sunlit surface can reach 123° C. The "dark side of the moon" can have temperatures dipping to -153° C. The moon only tilts on its axis about 1.54 degrees so there are places at the lunar poles that never see daylight. The Lunar Reconnaissance Orbiter measured temperatures of -238° C in craters at the south pole and -247° C (-412.6° F/26.15K) in a crater at the northern pole. That’s the coldest temperature recorded in the solar system. How do these temperatures compare with Mars? The REMS Team indicates that Mars average surface temperature is -53.15° C and varies widely over the course of a Martian day, from -128.185°C during the polar night to +26.85° C on the equator at midday at the closest point in its orbit around the Sun, with diurnal variations of up to 80°C to 100°C (https://cab.inta-csic.es/rems/intrument-description/ground-temperature-sensor/). As the coldest lunar temperatures are so much colder than the coldest Martian temperatures it’s obvious that either the Martian atmosphere or warmth from below the surface is keeping Mars relatively warm at night. The coldest temperatures for the first 31 Martian months of MSL operation on Mars are shown on Table 22. Figure 77� Ground temperature low changes for MSL Sol 1670 to 1671 are not matched by similar air temperature changes. As with Figure 78 the air temperature lows were both -76� C, but here the ground temperature lows differed by 30� C. Figure 78: While low air temperatures for sols 1720 and 1721 were both -76� C, the ground temperature lows differed by 44� C.
15.5.1. Why does the temperature fall more degrees at MSL in summer nights than winter nights? Note, it is of course true that winter nights are colder than summer nights at MSL, but the surprising phenomenon of a larger drop in degrees in summer than in winter is noted above in Figure 76. This seemed strange given the fact that nights are longer by about 32 minutes in MSL’s winter than summer, giving more time for the temperature to decline, and yet the rate of air cooling slowed then as the temperature seemed to head toward a limit imposed the heat retained in the ground or in the atmosphere. Normally the denser the air would be, the harder it would be to cool it. What do the two seasons look like with respect to the freezing point of water which is similar on Mars and Earth even though the boiling point is believed to be much lower on Mars than the 100° C on Earth (10° C for pure water, 24° C for a perchlorate brine - see Figure 79)? In the summer all but 11 out of the 146 sols with data had ground temperatures above freezing. Of the 11 remaining sols all ranged between 0° C and -2° C. For air temperatures in the summer there were only 13 sols above freezing and another 12 sols that reached 0° C.
In the winter 70 out of the 177 sols with data had ground temperatures above freezing. Another eleven reached 0° C. For air temperatures in the winter there were only seven sols above freezing and just another one that reached 0° C.
The legitimacy of MSL ground temperature data has been in doubt ever since it first appeared (retroactively) about nine months after landing. However, with two Martian years of MSL ground temperature data in hand, during the summer of MSL’s third year it been clear that there were radical low ground temperature variations taking place on a frequent basis that were unlike anything seen before. Nor did these extremely low temperatures correspond to low air temperature seen 1.5 meters up. We publish all REMS reports and their revisions on our site at http://marscorrect.com/cgi/wp/?page_id=622. The MSL Year 3 Summer results are also in Annex V of this report. A fragment of them are shown below as Table 23. As was shown on Table 22, during the first 29 months of MSL Curiosity operations -101°C (-149.8°F) was the coldest ground temperature was -101°C (-149.8°F). It was in the late fall. But on Sol 1670 the REMS Team claimed a ground low of -116 °C (-176.8°F), and it was still summer (Ls 340, with about 12 hours 3 minutes of daylight (see Figure 64). Odder still, while ground temperature lows between Sol 1640 and 1687 varied between -66° C and -118° C, a full 50° C range (80° F), the air temperature range only varied from -71 C° to -77° C, a 6° C (10.8 °F) difference. So clearly cold air is not what is producing the super cold ground temperatures. Further, every one of the sols had ground temperature highs above freezing with a range of 2° C (35.2° F) up to 16° C (60.8° F). On Sol 1721 (June 9, 2017) at Ls 16 REMS asked us to believe a new record low of -136° C which is -212.8° F. Again, there was no matching low in air temperature (it was -76° C). The amount of daylight on Sol 1721 was 11 hours 55 minutes. Could distance moved by the Curiosity Rover account for the erratic temperature variations at night? Not likely. JPL indicates that between Sol 1720 and 1721 Curiosity only moved 12.3 meters, increasing altitude by about one meter from 4,257 meters below areoid to 4,256 meters below areoid (see https://mars.nasa.gov/imgs/2017/06/MSL_TraverseMap_Sol1721_jschroeder-full.jpg). The topography for sol 1717 through 1721 is shown as Figure 80. It does not seem to indicate a major shift in terrain such as rocky to dune formation. The air and ground temperature lows for each sol have been added by us. Figure 80 � MSL Sols 1717 to 1721 topography with altitudes below areoid with low air and ground temperatures posted by the REMS Team. Problems with ground temperature lows began to crop up in March, 2017. This was mentioned by us in conjunction with Sols 1670 and 1671 which are shown on Figure 77. Then, like Figure 78, the air temperature lows were -76° C, but the ground temperature low for Sol 1670 was -116° C, while it was -86° C on the following sol. The JPL topography map for sols 1639 to 1671 is found at https://mars.nasa.gov/multimedia/images/2017/curiositys-traverse-map-through-sol-1671. On Figure 82 we have tried to pair air and ground temperature lows with sols. For some entries there are best guess estimates where the JPL map lacked a specific point for the sol. On Figures 81 through 82 we looked for a correlation between ground temperature lows and surface type (sand dunes vs. rocks) but there was no consistent pattern that could explain extreme cold seen. Figure 81 - JPL identified positions and MOLA altitudes for sols 1639 to 1671. Low air and ground temperatures were added based on REMS Team weather reports. More temperature detail is found on Figure 82. Table 23 - Starting around MSL Sol 1640 (March 18, 2017) extremely low ground temperature lows became totally inconsistent with anything seen before since MSL landed in 2012. 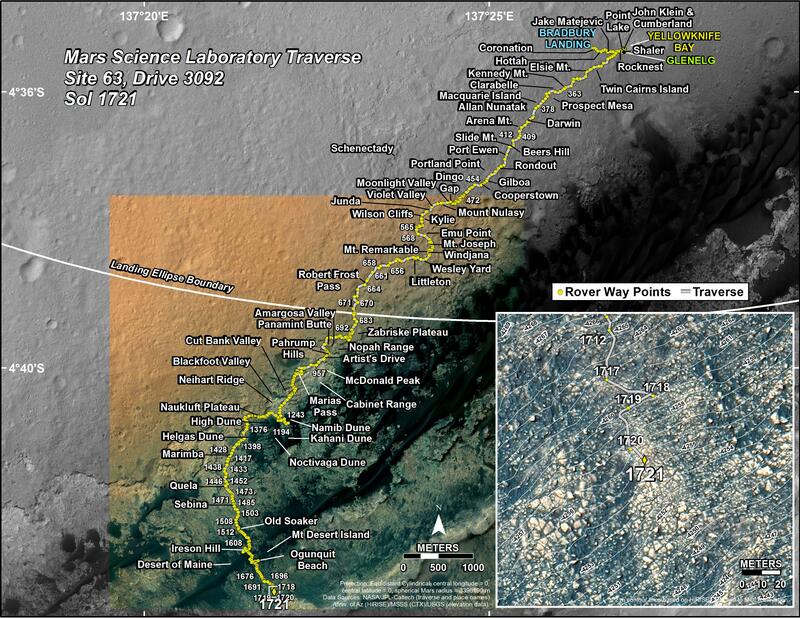 Figure 82 � JPL published the positions for MSL Sols 1635, 1636, 1639, 1642, 1643, 1645, 1646, 1648 and 1649. During these dates low ground temperatures varied between -79� and -93� C. However, the dates that they did not show had ground temperature lows that varied from -80� and -111� C with five temperatures colder than -101� C, the coldest temperature ever observed by MSL. At Sols 1647 to 1648 Curiosity was at an altitude of 4,300 meters below areoid. At Sol 1.635 (upper left) Curiosity was at 4,304 meters below areoid. This report is continued with Section 15.6.1 here.